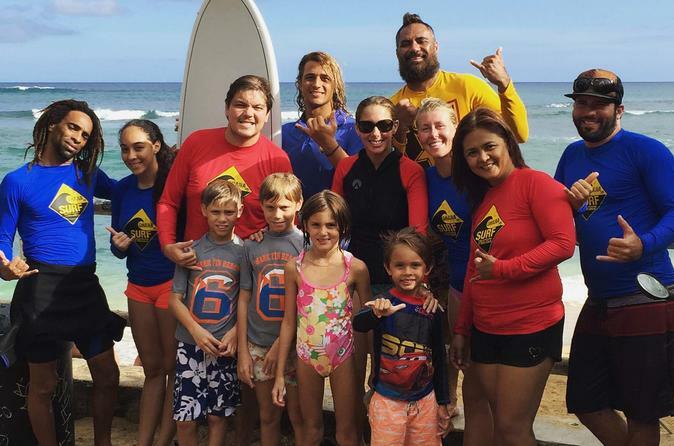 Bring your family and enjoy the best surfing experience Waikiki can offer! The Family Package is an affordable way to have the whole family surf together while keeping it safe and fun! Our instruction is customized to all ages and skill levels. With our new, high-quality boards, reef shoes and rash-guard shirts, instruction and video-viewing in our luxury Mercedes-Benz Sprinter van, and best-in-class, professional surf guides, we provide the ultimate family surfing package. Develop hidden talent. Strengthen the bonds between families. Encourage personal discipline. And do it all through a simple but exhilarating connection with the ocean environment. There are few activities that offer genuine life-changing experiences for the entire family quite like surfing. To start off your family package, we pick you up! Our friendly staff will meet you at one of our convenient hotel pick-up locations. You’ll be stoked to ride in our air-conditioned, clean, easy-to-spot, orange-and-black "surf school bus." We will then shuttle you to one of Waikiki’s best surfing spots located just outside of the foot traffic. Once by the ocean, you’ll prepare in the comfort of our Mobile Command Center, a brand-new, luxury, custom Mercedes Benz Sprinter Van. You’ll watch our safety video and talk about surf conditions. We’ll talk about your previous experience, swimming strength or any other concerns or conditions. We'll discuss what you hope to experience on the water and how our time together fits into your learning curve for surfing. Finally, we gear you up with reef shoes and rash guard shirts and have you walk your lesson boards (new and high quality) to the beach. When we get to the sand, we conduct our land lesson. We’ll walk through the basics of the surfing experience and then have you practice a few times before you get into the water. If you have mastered the basics or progressed in your surfing, we will instead work on the next step in your training. When you’re comfortable and ready, we leash ourselves to the board and into the water we go! Our expert surf instructors have over 75 years aggregate experience. We chose coaches who are not only good at surfing but who have a passion for teaching. Our surf guides have spent hundreds of hours learning our instruction method so that you will can continue to learn every time you join us, regardless of instructor or your skill level. We will help you learn the fundamentals or help you to level up some specific aspect of your surfing. Safety is our top concern. All our instructors are CPR certified and most hold blue cards. For families, we always have a minimum of two instructors in the water with one acting as a cameraman. While safety comes first, our team is also totally focused on helping you have an unforgettable experience - one that brings the aloha back to surfing.